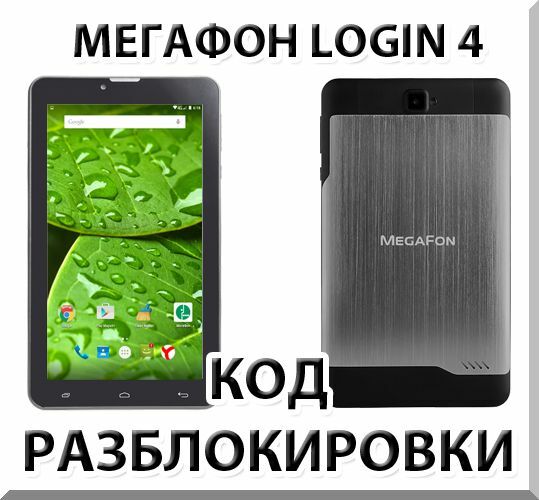 Megafon Login 4 (MFLogin4). Network Unlock Code. After I received the unlock code to the plate - he begins to work with a SIM card of any operator. 1. To obtain the unlock code you will be required to inform us IMEI-number of your device. IMEI tablet can be seen on the label under the battery or by typing on the tablet combination: *#06#. 4. Insert the SIM card plate of another operator, and enter the code to unlock it. 5. If you entered the code correctly, Megafon Login 4 (MFLogin4) once registered with a network operator, SIM card that you have installed. Before purchasing an unlock code, insert the tablet SIM-card of another operator and make sure that it prompts you for the unlock code network, ie that attempts to enter the code is not used up. Attention! This product is suitable only for the release of the tablet 4 Megafon Login (MFLogin4), to other models of tablets it is not suitable. If the payment and receipt of goods it turns out that you have a different model of the tablet or on your device exhausted all attempts to enter the unlock code - a service of the unlock code is considered to be provided in full, and money spent are non-refundable. Be careful! Beeline phone unlocking Smart (Huawei Y320). Code.